The Halloween spells continue with more fun Halloween treats and a few home decorations! Eeee! 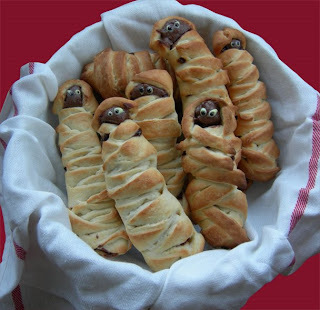 I love these "Morning Mummies" from Unfurled. They are made from an Ikea break mix (but you could use your own dough recipe or a ready-made store-bought kind I'm sure) filled with Nutella. Mmm, Nutella. I can't get enough of that stuff. My kids are going to freak out when I make these! This eerie eyeball soup is perfect for a cold Halloween night. It's just tomato soup, a hard-boiled egg, and a sliced olive! So easy! I bet even my 3-year-old would eat tomato soup that looked like this. We found this idea in Matthew Mead's cool Halloween book, Halloween Tricks and Treats. He is amazing. These little cuties are "cupcake cuppies." How cute is that name? They're little paper wraps for your cupcakes! Yummy Cuppy Crafts sells them in her Etsy store in tons of different designs for every occasion. I love these, but I have to admit I just want to eat that frosting off the top of that cupcake right now! Look at these adorable felt pumpkins! 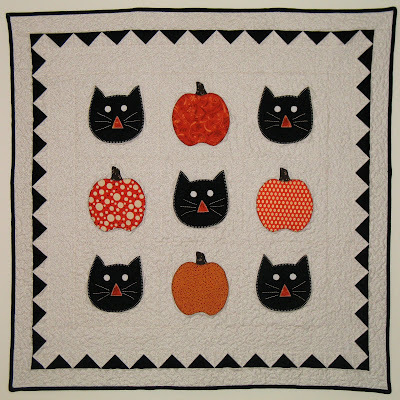 Pattern Bee is offering this pumpkin pattern FREE! I'm thinking these are a great fall decoration for those of you with little ones running around your house. You know the pumpkin (and the kid) will be okay if someone picks it up and hurls it across the room at their little brother or something (not that that ever happens at my house). Our talented friend Kayleen made this awesome Halloween wall hanging from the pattern in this book, Quilting With My Sister. Aren't the fabrics she picked for the pumpkins cute? But you better start soon if you want to hang it up this year! I love the cupcake holders. I have a thing for cupcakes and those make them even cuter! I just found your blog and I think your it's so cute! I have a 15 mo. old and I can't wait until she's a little older so I can do some of these things with her! 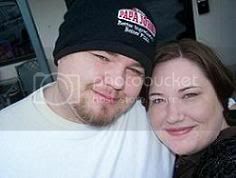 I just found your blog today and I have to say its great!! Keep up the good work. Look forward to being able to do some of the crafts. I just found your blog, too. What a great site! Thanks for sharing. I'll be checking back! Love your site. I just discovered it and can't wait to see more! Love all of your goodies! The eyeball soup is TERRIFIC!! !